In April at the Asian Cup in Yokohama he defeated Fan Zhendong, last week in Shenzhen he accounted for Zhang Jike, now on Saturday 9th June at the Seamaster 2018 ITTF World Tour Lion Japan Open in Kitakyushu he beat Ma Long. The feats of Tomokazu Harimoto, who will celebrate his 15th birthday later this month, are staggering; in a space of three months he has beaten China’s elite. At the quarter-final stage of the Men’s Singles event, the no.6 seed, he overcame Ma Long, the no.2 seed, in six games (11-8, 11-9, 11-7, 3-11, 2-11, 11-6); simply staggering. 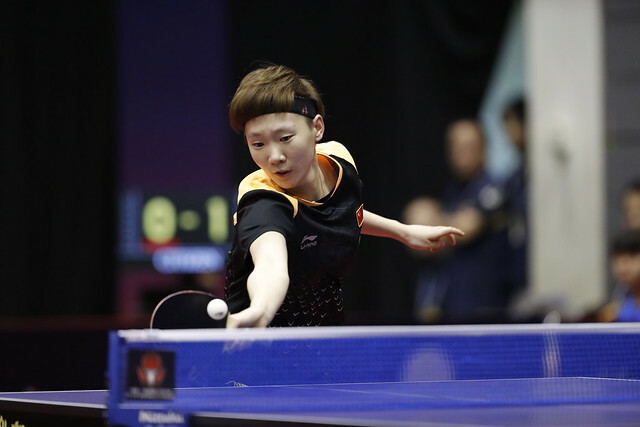 The success recorded by Tomokazu Harimoto overshadowed the fact that Ma Long will remain one short of Vladimir Samsonov of Belarus in terms of ITTF Men’s Singles wins. Also the win put into the shadows two most notable seven games quarter-final contests. Zhang Jike overcame Japan’s Jin Ueda, the no.13 seed (9-11, 11-7, 9-11, 8-11, 13-11, 11-7, 11-7), Korea’s Lee Sangsu, the no.4 seed recovered from a three games to one deficit to beat Chinese Taipei’s Chuang Chih-Yuan, the no.9 seed (11-3, 8-11, 9-11, 3-11, 11-8, 11-5, 11-4). Full distance wins for Zhang Jike and Lee Sangsu, for Germany’s Timo Boll, the top seed, life was less traumatic; facing Japan’s Kenta Matsudaira, the no.8 seed for the fourth time in his career in a world ranking tournament, Timo Boll maintained his perfect record. He beat Kenta Matsudaira in five games (12-14, 13-11, 11-3, 11-7, 11-9). At the semi-final stage Timo Boll meets Zhang Jike, Lee Sangsu opposes Tomokazu Harimoto; the penultimate round followed by the final will be played on Sunday 10th June.